You may have heard that earlier this month, the Federal Communications Commission (FCC)—helmed by Trump appointee Ajit Pai—voted to gut the open internet principle known as Net Neutrality. This move is direct threat to women’s health, reproductive justice, and all movements that use the Internet to educate, organize, and fight back. But there’s still a chance to save the Internet as we know it. Enacted in 2015, Net Neutrality prohibits internet service providers (ISPs) like AT&T, Comcast, and Verizon from speeding up, slowing down, or blocking any content, applications, or websites you want to use. Experts have pointed out how dismantling Net Neutrality could impact everyone from those involved in the #MeToo movement, to communities of color, to small business owners, to low-income people. “Particularly damning is what today’s repeal will mean for marginalized groups, like communities of color, that rely on platforms like the internet to communicate, because traditional outlets do not consider their issues or concerns, worthy of any coverage,” wrote FCC commissioner Mignon Clyburn in her dissenting opinion to the December 14 vote. And doing away with Net Neutrality could really hurt women, the reproductive justice movement, and anyone who needs the kind of reproductive health care services we provide here at Maine Family Planning. Once upon a time, that might have sounded far-fetched. But given the Trump administration’s transparent war on women, it’s a future sadly worth considering…and girding against. What’s more, the end of Net Neutrality could spell trouble for Maine Family Planning’s groundbreaking telemedicine services, which include abortion care. Loosening the reins on mega-telecom companies and allowing them to engage in something called “paid prioritization”—establishing “fast lanes” for sites that pay, and slow lanes for everyone else—would be bad news for rural patients who access health care services at home. Increasingly, telemedicine is being used to bring higher-end health care services to remote and rural areas to reduce health disparities. For telemedicine to be scalable and positively impact cost and outcomes, there must be a predictable infrastructure connecting patients, care providers, and technology. A prerequisite for telemedicine is broadband connectivity between telehealth sites. Reliable low cost service for telehealth is potentially threatened by the loss of [Net Neutrality or NN]. What happens to telehealth if Netflix traffic is preferred above medical applications? Could Internet Service Providers (ISPs) offer better services for one hospital system than another, helping them take over telehealth in a region? The undoing of NN weakens the infrastructure of reliable low cost connectivity that telehealth systems depend upon. Every day, Maine Family Planning works to increase health care access for rural and low-income women. Undoing Net Neutrality puts that access at risk. 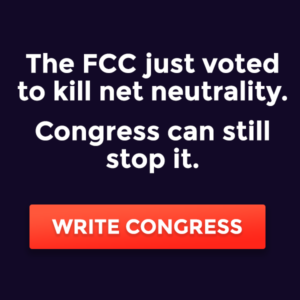 Congress can still step in to restore the open Internet that the general public wants and deserves by overturning the FCC’s order through a joint resolution under the Congressional Review Act. Write or call your Member of Congress now. In Maine, Rep. Bruce Poliquin in particular needs to hear from us.